In the House, Richard Nixon’s the one. In the Senate, Bill Clinton has not stopped thinking about tomorrow. But both of them are about to be replaced in modern political history* by Barack Obama unless Election Day turns out far differently than projected. Barack Obama must not like his fellow Democrats. How else can we explain that the man with the golden political touch when he is on the ballot is political absinthe in the midterms. What Election Outcome Do Voters Really Want? 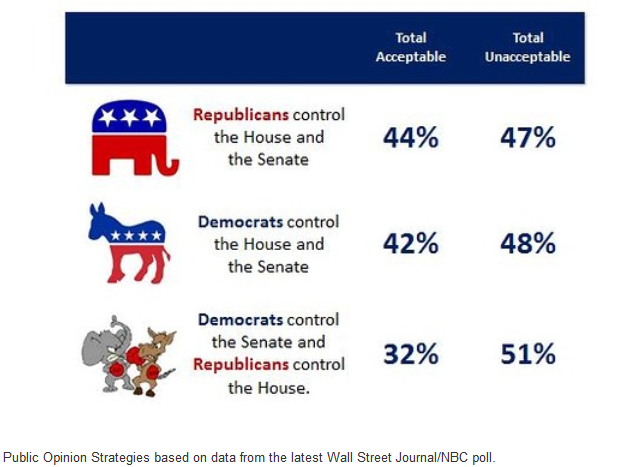 Given a choice of three potential outcomes for the November election, Americans underscore their lack of love for the political parties by opting for none of the above. The Day Democrats Never Thought Would Come, Is Here! This is not another piece talking about the GOP challenges among women voters. Nor is this another piece analyzing the data about the gender gap.